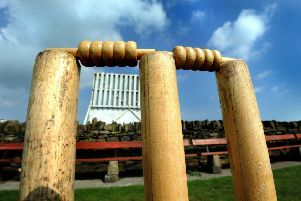 Ashington cricket reached double figures on Saturday as they chalked up their tenth victory of the season – but only after a close-fought encounter against Percy Main. The Colliers had retained the League Cup recently after defeating the Villagers and on Saturday, in a rain-affected clash which was reduced to 47 overs per side, revenge was looking distinctly on the cards. That was until the ever-reliable Paul Rutherford was introduced to the attack. Rutherford completely changed the course of the game as he took four wickets and held a vital catch as the North Tynesiders lost their last six wickets for 33 and were bowled out in the 41st over for 144. Ashington pace man Callum Storey had bagged both openers – Anthony Hornby and skipper David Anderson – inside the opening nine overs. Both fell in identical fashion to catches behind the stumps by wicketkeeper Daniel Grant, the latter an outstanding effort. When a throw from the boundary by Jack Jessop resulted in James Stanistreet being run out, the visitors were on 39-3. But led by Michael Phillips and supported by Philip Cramman, the pair swung the pendulum in their side’s favour and had added 60 when, shortly after drinks, the introduction of Rutherford proved pivotal. The left-armer tempted Phillips and he was stumped by Grant one run short of a half century. Two overs later, Will Taylor fell lbw then the spinner lured Cramman (37) into a drive which was well pocketed at long on by Sean McCafferty and, two balls later, Michael Boyd gave Grant his third catch of the innings. Ian Sharkey returned from the pavilion end to have Andrew Green caught at fly slip by Rutherford off a skier on 124-7 but Amit Sunda looked threatening and clipped a couple of boundaries to leave the game on a knife edge. However, Matty Collins clinched victory for the home side after trapping Mark Armstrong lbw then bowling last man John Nicholls first ball with an off stump yorker. Rutherford finished with glowing figures of 4-17 from nine overs with Storey taking 2-17, Collins 2-46 and Sharkey 1-26. Earlier in the afternoon, Ashington battled through a tricky opening period before eventually finishing on 170-7. Daniel Grant (20), Neil Wood (26), Jack Jessop (36) and O’Brien (29) all featured before Jack McCarthy boosted the total with a late flourish of 36.